Priest burned crosses on Jewish property during college years in notorious white supremacist group, never paid court-ordered restitution. A Washington-area Catholic priest who left his post because of revelations of his Ku Klux Klan past never apologized or paid court-ordered restitution to two Jewish institutions for burning crosses on their property. The newspaper suggested that Aitcheson wrote his essay after Maria Santos Bier, a freelance journalist and member of the Arlington Diocese who was a former history student of Aitcheson’s in the early 2000s, asked the diocese about Aitcheson’s KKK history and said she might write about it. 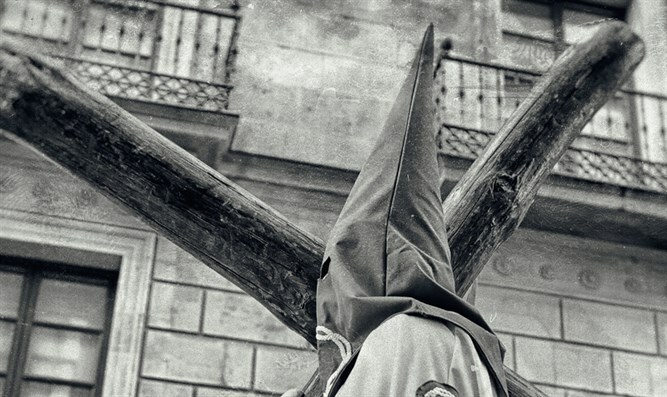 In 1982 he was sentenced in a civil case to pay $23,000 in damages to the two Jewish institutions, a black couple and other Jewish victims for the burning crosses. He decided to become a priest shortly after the sentence and was ordained in 1988 at the age of 33. Aitcheson has taught about the Civil War, calling it the “war of Northern aggression,” a former altar boy told the Post. He also was a collector of Civil War memorabilia. “I try to think good things about our priests and it’s difficult to learn of this information and think good things,” one of Aitcheson’s current parishioners, Mark Krajewski, told the Post. The diocese has offered to help Aitcheson make amends to his victims and says Aitcheson is willing to do so, according to the Post.